Yes, this happened. Ree Drummond, The Pioneer Woman herself, came to my little hometown for a book signing!! When Julie told me about it, I about flipped out. Foodie celebrities just do not come to our town for anything. This was the most exciting thing that ever happened in Wichita! Well, at least for me. Julie and I had planned to go together, but she ended up moving earlier than planned so Dennis was my date for the evening. Dennis, the anti-foodie. The anti-foodie who won’t even read his own wife’s food blog. Perhaps not the best date for the occasion, but he’s a trooper and is usually up for anything. He’s incredibly supportive, despite refusing to read my blog, and I think my excitement made him a little eager himself to meet this superwoman. We arrived at the Forum Theater (previously a church) an hour early and still there was a massive line. We were even further back than in the photo above, rounded around a corner, but I forgot to take a photo until that moment. Hello, Veronica, a blogger must remember to photograph everything when it comes to such a monumental occasion! I didn’t make that mistake again and documented the remainder of the evening by snapshots…and even short video. Of P-Dub singing!! I apologize for all the exclamation points. It’s hard to control my excitement and enthusiasm. It only took us about fifteen minutes to get through the line and into the theater. Everyone with tickets #500 and under could go in right away. There were tickets all the way up into the 1,300s and I think they managed to fit most people in. Apparently there was an “overflow section” but I never saw it, and I guess those who couldn’t find seats waited there for the signing. Dennis, the sweetheart, went to the front of the theater to take these photos for me. We were seated in the middle, way in the back. That section was flat, not tiered like the front rows, so it’s harder to see all the people back there. I can’t even make out my own head, but I could see the stage just fine. After an hour of waiting and reading her cookbook (yes, reading, I read cookbooks like novels) while Dennis read Anthony Robbins’ Awaken the Giant Within, Ree was finally introduced and came striding out on stage. Seriously. P-Dub in the flesh. Is this really happening? Really? But she made it very clear how real she was as she nervously criticized her entrance and the awkward way she walked behind the movie screen instead of in front of it. She apologized for being nervous and sweaty, then asked for a show of hands of everyone that got sweaty when they were nervous. She was so genuine and sweet, even if you didn’t know her from her blog already, you had to love her immediately. Dennis was not immune to her charms and was laughing all through her presentation. She gave a slideshow presentation of her life, with all the humor she infuses into her blog. Then we waited. Books were signed according to the number on your card, so there were 182 people ahead of me. And there were no limit to the amount of books she would sign. I’m sure Ree is sporting a permanent hand cramp right now, as she had to have signed thousands and thousands of books that night. What a trooper! After waiting foreeeeever (OK, more like two hours), we finally were next in line!! I was so flustered, I had nothing to say. I could have said, “I made your chunky chicken soup five times this year already!” I could have told her how well she did with her presentation. I could have told her how honored I was to meet her. I could have told her how much I enjoyed her book, Black Heels to Tractor Wheels, or even asked her if Marlboro Man was taking care of the kiddos by himself while she was away. But I couldn’t say anything! Since I was so quiet, she finally asked me, “Are you from Wichita?” How humiliating, to have forced a huge celebrity to try to spark a conversation in the face of my epic silence. That she even bothered is a testament to how nice she truly is. “Yes, this is the most exciting thing that’s ever happened to me!” I blurted. And that’s all I said. Ugh. Dork master! Run awaaaaay! IT’S THE CREEPER BUNNY! 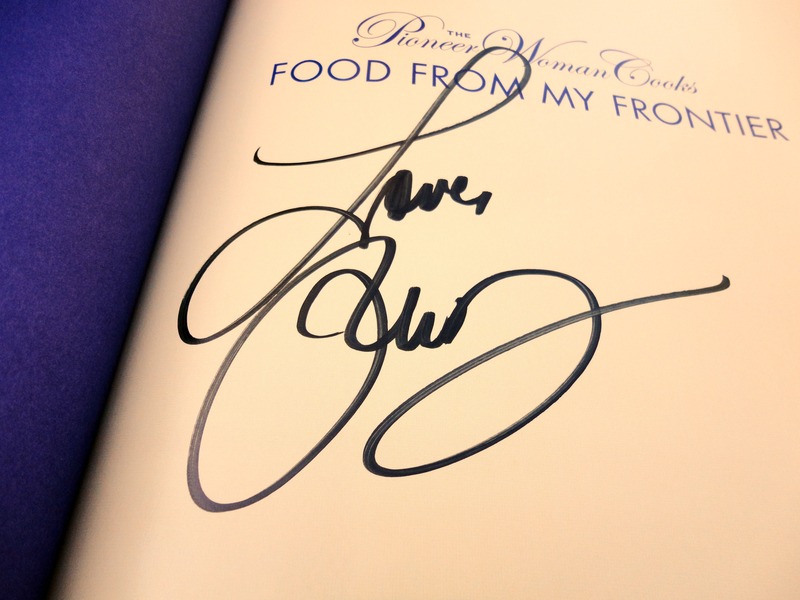 The cookbook follows the format of her blog, giving step-by-step photos for each recipe. 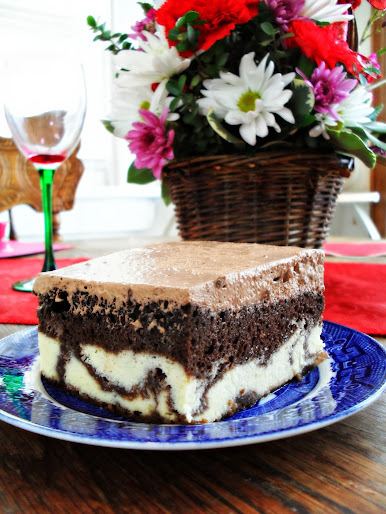 If you like photos with your cookbooks, this one is for you! As far as I can tell, there are no new recipes–you can get them all online (though at least a few recipes in the book are improved from the website versions, like the Coffee Cake (the first one I’ll be trying! )), but if you love owning cookbooks, love the Pioneer Woman, or need a gift for a new bride/groom to help them learn how to cook, this would be great. Would you like your own signed copy? Well, it might just be your lucky day, because I got a second copy signed to give away to one of my readers! 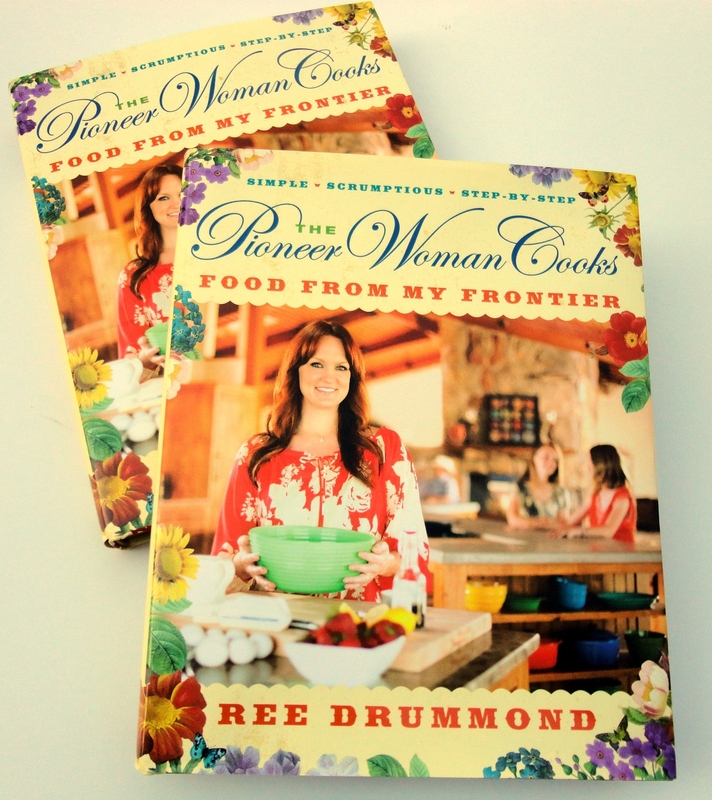 If you’d like to enter to win, just tell me what your favorite Pioneer Woman recipe is, or what recipe of hers you’re looking forward to making. You can still leave a comment without entering, just be sure to answer this question for your comment to count in the drawing. Giveaway will close April 19th at 10 PM CST, and I’ll announce the winner on Friday. If you’d like additional chances to win, you can do any or all of the following (and yes, it counts if you already do/have done them, just leave a comment letting me know). Be sure to leave a separate comment for each, and make sure you answer the question above first, or none of the additional entries will count. *Subscribe to Veronica’s Cornucopia by RSS or email (email subscribe box is in the upper right column). *”Like” Veronica’s Cornucopia on Facebook. *Pin this post on Pinterest. *Tell your friends about this giveaway on Facebook, including a link to the post. UPDATE: This giveaway is now closed. Congratulations to Brandee Lake! 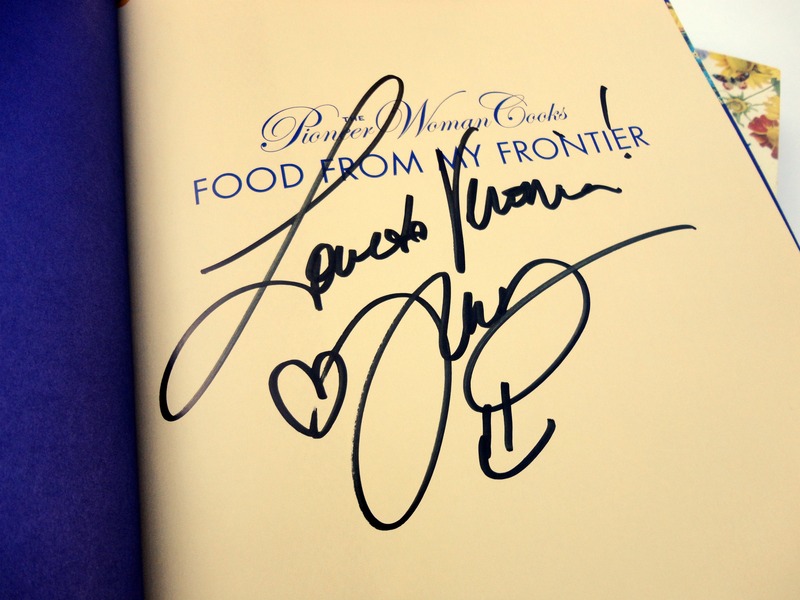 Posted in Announcements & Awards, Life, Videos and tagged book signing, cookbook, food from my frontier, giveaway, pioneer woman, signed copy. Bookmark the permalink. Pretty certain I didn’t win, but can’t wait to hear who did! Oh my goodness! I totally forgot to do the drawing–I’m glad you reminded me. Thanks! Your chances are lower since you commented first, but the last drawing I did, I was shocked that random.org came up with #1! I’ll let you know if you won. Oops! Missed the giveaway but I have to tell you that I do know Mikey, Ree’s brother. He is quite the character. Remember the hospitality room posts I did about our tournament? Mikey is a staple there every year. No way! That’s too cool! I bet he has a similar sense of humor–so fun!